In summary – the Exchange infrastructure is spread across 3 geographic sites. 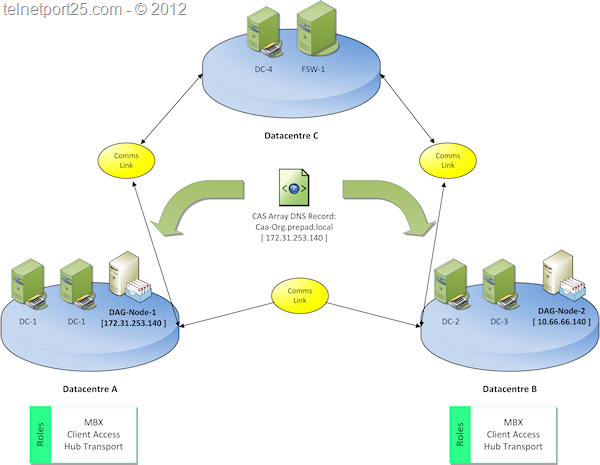 There are two DAG nodes on site A and B which are also running the Client Access Server and Hub Transport roles. At site C there is a file share witness server which has connectivity and oversight of both sites A and B. Client Access Servers are provisioned as a Client Access Array where the DNS record for the CAA points at the node located in site A and is manually changed when a switchover is needed. There is NO hardware load balancer within the configuration. Now I know you might be thinking; the above is not technically a supported configuration – and you would be right – but in fairness, there are a large number of companies around which have exactly this type of Exchange 2010 topology, so whether we like it or not many of us are in the position where we have to support something that is not quite the way we would like it to be. So given the above situation, what can we do to alleviate the issue as described above? script_Logging "Checking Existing Client Access Server Status" "Green"
script_Logging "Client Access Array appears to have failed!" "Red"
script_Logging "Client Access Array is OK!" "Green"
script_Logging "Constructing DNSCMD Update Commands" "Magenta"
$ArgsDel = "$PrimaryDNSServer /recordDelete $dns_Zone $dns_CAA_ARec A /f"
$ArgsAdd = "$PrimaryDNSServer /recordAdd $dns_Zone $dns_CAA_ARec $dns_CAA_ARecTtl A $CAASwitchOverServerIPAddress"
script_Logging "Removing old record: $DNSCMD $ArgsDel" "White"
script_Logging "Re-adding new Record: $DNSCMD $ArgsAdd" "White"
script_Logging "DNS Switchover Completed" "Green"
script_Logging "Starting Client Access Array Tests" "Cyan"
script_Logging "Starting DNS CAA Switchover" "Cyan"
In order to get the best out of the Switch Over script you should schedule it to run on your chosen server at regular intervals (I would recommend every 5 – 10 minutes). This will allow for the remote server running the script automatically detect if the CAA goes offline. If you plan to run the script “standalone” (e.g. just to perform a DNS change when you know that the Primary node has failed) I recommend that you reduce the $ConsecutiveFails count to 1. Of course the best course of action is always to try to deploy resilient Exchange infrastructures – but if you find yourself working with the scenarios described in this article – feel free to have a look.